This tour was by far the best fun we had. This was our first time and our guide was just the best at helping us prepare for our journey. Our guide was very knowledgeable and such a people person she was just amazing. If you like Segways then youll love this tour. We did the 2 hour tour of the Art Deco district. Our guide was extremely knowledgeable and kept a perfect pace and balance of riding and learning about the sights. This is one tour that I would do again. The only caution that I have is that it is difficult to find parking close by. We lucked out and found a metered spot about a block away. It was an amazing tour. I was lucky and got a private tour no one had registered for the date and time I had selected. Sean is an excellent guide and made the whole experience fun ! Very nice people to deal with. Really took the time to make us feel comfortable. Great equipment. The best way to see Miami Beach. It covered everything I wanted to see and it was so much fun. The tour guide was very knowledgeable and gave everyone on the tour individual instruction on the Segway, until he was sure we were each comfortable on it. I loved it. The tour guide, Santiago, was great! I was nervous as I hadn't been on a segway before. He was very perceptive and spent a little extra time making sure I got the hang of it and felt more comfortable as the tour went on. Our tour had 6 people. We were given helmets to wear, were introduced to each other, and given a brief training before heading out on the road. They don't give you a complimentary bottle of water, but it is available for sale at the starting location. I should have brought one with me. It was really hot and humid that day. We toured Miami Beach for a full 2 hours after the training. We went all over the art deco area. We stopped on our segways frequently so Santiago could tell us about the history of a building, an area, or people who had built or frequented an area. He was very knowledgeable. We also stopped and parked the segways a few times, which felt really good on my feet. We walked into a part of a park by a beach where segways aren't allowed, stopped by a walk up snack and coffee shop, and stopped by Miami Beach Botanical Garden where we could use the restroom. There were several opportunities to take pictures. Santiago even recommended a great Cuban restaurant near our hotel for dinner. I would definitely do this again. Would massively recommend this tour - was a lot of fun and our guide was fantastic! Great guide, very informative and a nice tour around South Beach. 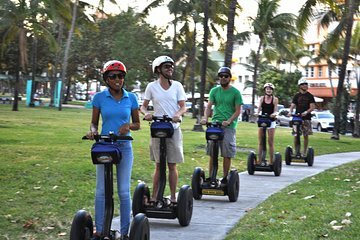 Love riding segways, so would always opt to do one of these tours. This was very enjoyable. We got to see so much more of the area and our guide was very friendly and knowledgable. Would happily recommend this tour. We had a wonderful and knowledgable guide. Who knew there was so much to look at! Quite refreshing to use a Segway on the road for the first time too. A lot of countries make you go on the pavement or private land of some kind, so this really added to the excitement!